amenities you have grown so accustomed to on your hibernating yacht. You are a Rhodes Buyer. 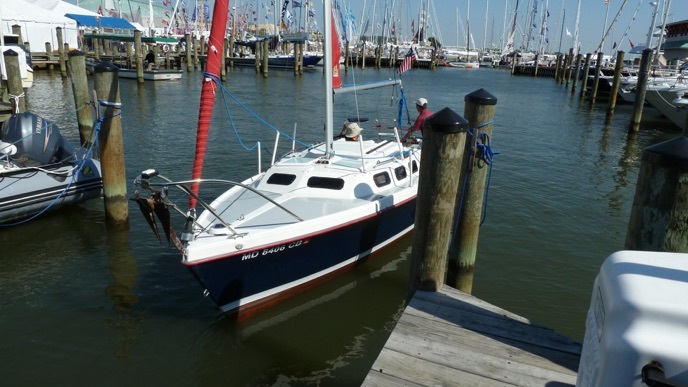 A buyer with cash from the big boat sale that lets you take advantage of the deposit savings program. 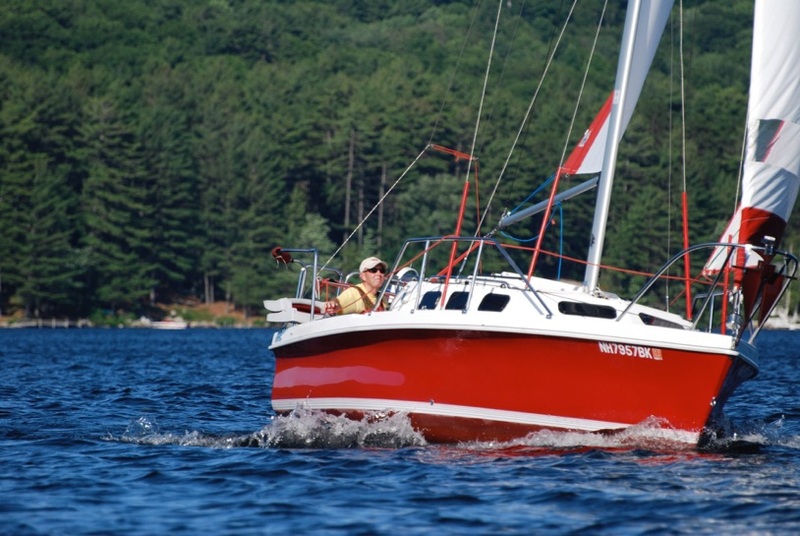 A program that lets you spend less for sailing more. You are a Rhodes buyer. 3. 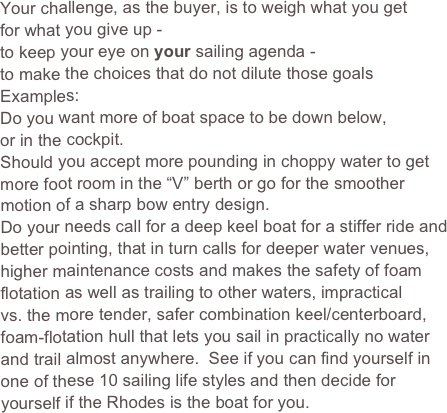 You are a new-to-sailing Sailor: YOU ARE A RHODES BUYER. PERIOD. 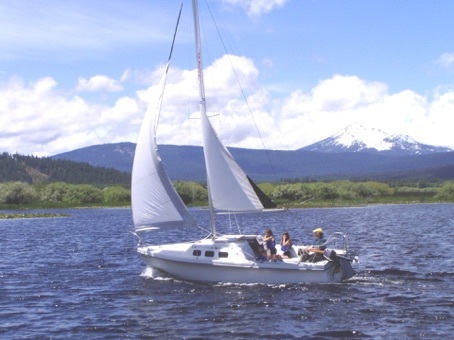 whether learning to sail on a sky high Oregon lake . . .
or great Lake Michigan . . . or any other body of water. the tiller to go below and grab a beer. Age: Does not matter, nor does species. “My god, the dog is sailing”. 4. You are an avid Racer - comfort be dammed. The Rhodes is Not for You . 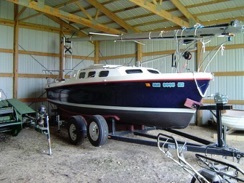 . . . .
Then a Rhodes RCR (Rhodes Club Racer) may be for you. We are often asked how fast is the Rhodes. Our stock answer is 60 highway, 8 surfacing. version gets back to racing basics. “We sailed to first place in our Spring series”. under phrf. You really should market the RCR”. have already discovered - and they are missing - the joys of sailing. motor boat’s roar. “Neither did I”, she returned, “until I took the tiller. And I love it”. 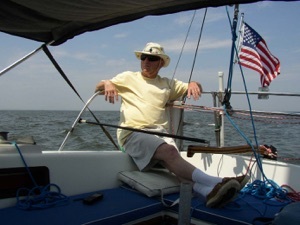 You have come to realize that the dream of moving up to larger and larger sailboats and then sailing around the world is a lifetime achievement few of us will do. 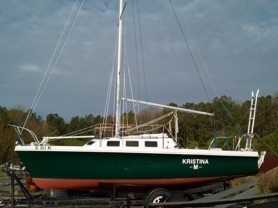 And that you are not going to retire and live on your sailboat. 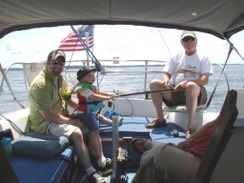 That chartering the big one is the way to go whenever you need to re-purge the early schemes. 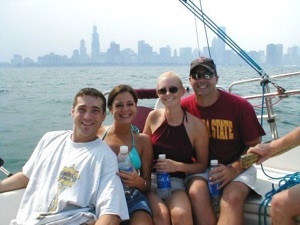 You and your crew agree sailing is a big part of your life but still, only a part of it. And your hard earned sailing wisdom tells you 22 is the ideal size for you - just find the most 22 available. If you are “6” going on ”7”, You are a Rhodes buyer. 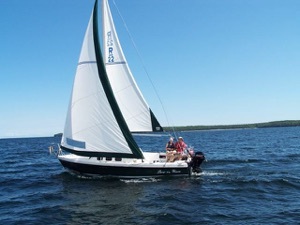 While many sailors move up and down, the Rhodes holds the record for moving the most sailors sideways (22 to 22) so, like you, they can be sailing the most 22 possible - and the 22 most versatile. or multi-day outings, a trailer bound Rhodes is ideal. A plant worker can rig a Rhodes in 20 minutes. Of course you may take twice that time, particularly if you have a helper, since conversation adds drastically to rigging time. 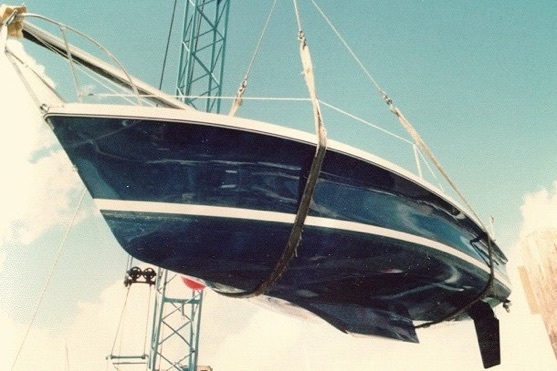 Rhodes special trailing features do make mast handling and launching relatively simple compared to other cruising boats. For starters all steps can be done single handed and none of the operations require a single tool. Where we once said, “one man can raise the mast, we just have not found him yet”, today, with the Rhodes mast hoist system, one lady can raise the mast. 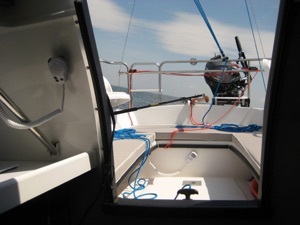 Once the mast is up you are ready to go since the main sail, main furling system, genoa, genoa furler, the boom and al lines are all raised at once in one single step. Gentle car braking self launches the boat. 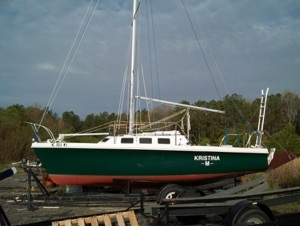 With furling sails and the DOWN board for under water centering, the boat can literally sail onto the trailer. Putting the Rhodes in and out of the water is stunningly fast, easy - and also fun if you have an audience. The Rhodes radio controlled trailer winch option makes positioning on the trailer even easier. On the highway the low profile and low external ballast make for a more comfortable tow vs. jettisoning type water ballast boats. For active trailer sailors wanting to speed things up even more, fast pins and velcro ties are a big help. The trailer life style really pays for itself when “dry sailing” at mariners where the boat is trailer stored fully rigged for just minutes in and out on sailing days. 8. 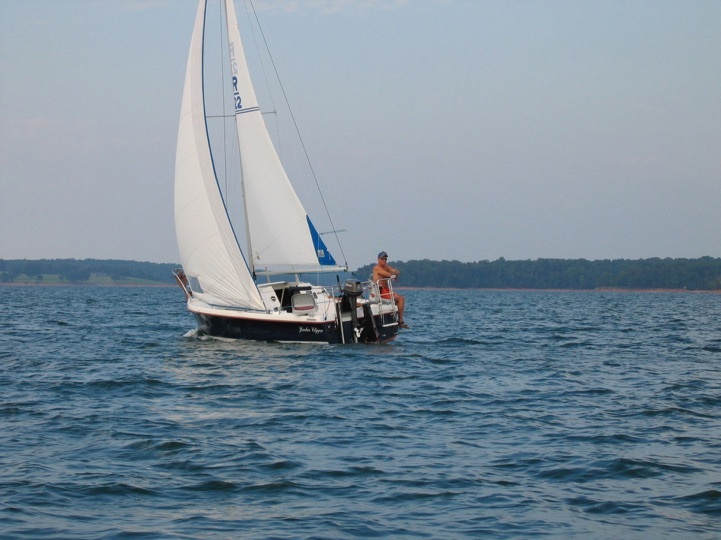 You can only afford only one boat - but want to do river, lake and ocean sailing. safety that stretches your sailing limits. 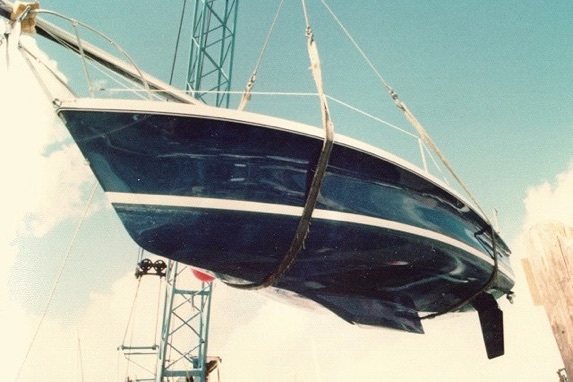 Isle of Bimini - a log no ocean crafted boat could enter. 9. 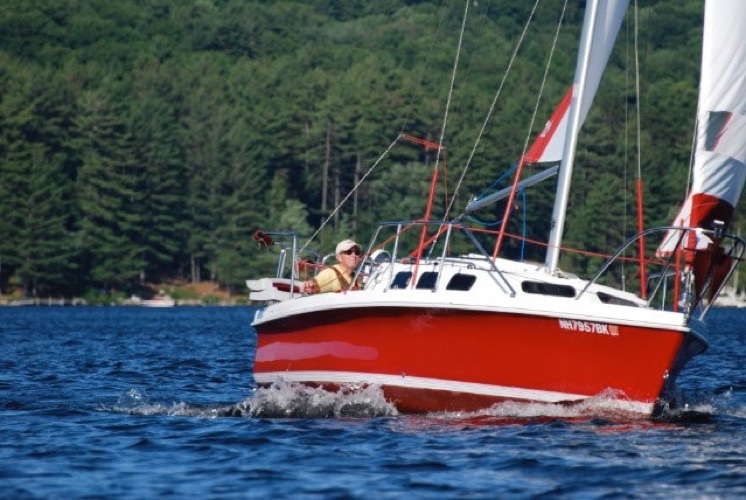 You are sold on sailing a Rhodes 22 - but your budget isn’t. There is nothing like a brand new Rhodes: The way it looks, the way it sails, the way it feels slicing through the water, the way all of its elements function. But your first Rhodes does not have to be new. Visit http://www.usedrhodes.com and find your first Rhodes in the GB Corral “The World’s Largest Selection of Used Rhodes 22s in a Single Location” with in-house financing. OR, if up to it, do the e-mail leg work checking out owners ready to sell privately. They are listed in “Part Two” of the aforementioned used Rhodes site. 10. 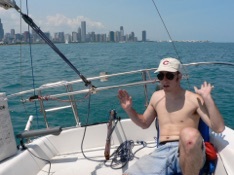 You are a Single Hander Sailor: You know your family is never going to share your enthusiasm for sailing. 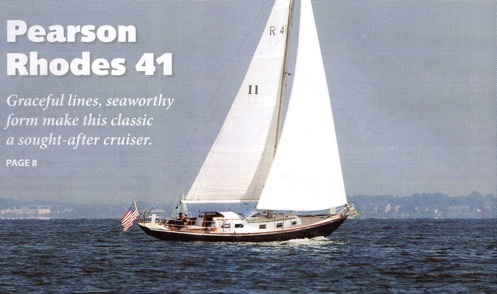 Or maybe you revel in crew-less sailing. You need: All lines cockpit controlled. A variable tiller extension for anywhere in the cockpit control. 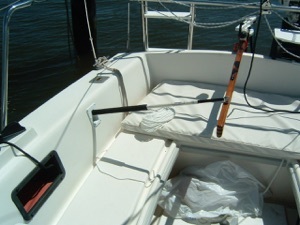 A tiller lock box that lets you sail hands free. 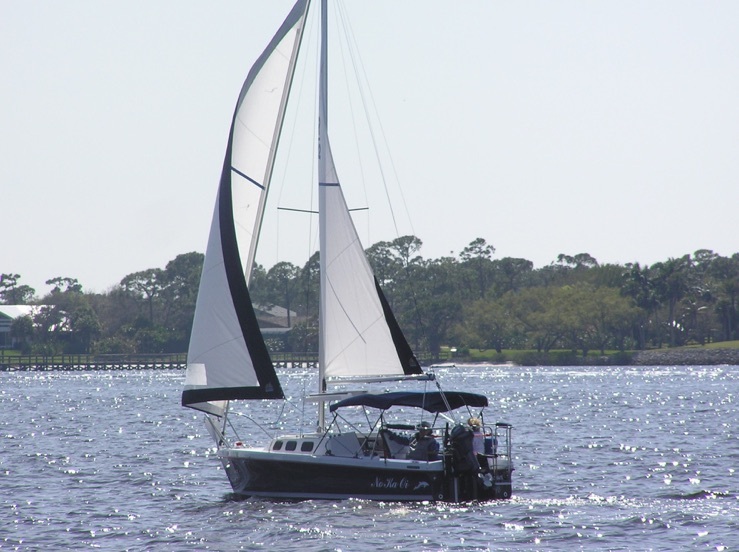 Sails that single handed re-size to your comfort level of the moment. 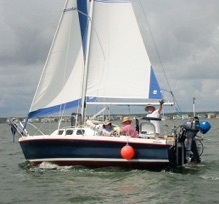 A variable height boom that puts you in control of your main sail’s center of effort to make single handing and change of mind winds, a successful marriage. 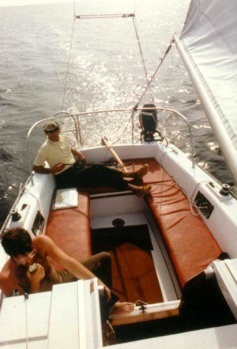 In this appealing scene, on a rather windy day; the genoa and the IMF main nicely trimmed, the boom is in its lowest setting for flatter sailing, the tiller locked in its hiking stick lock box and the loan crew, as part time captain, doing absolutely nothing as he and his Rhodes sail off, leaving all cares behind, turns something in you on - and you would like to change places . . . . . . . . . . You are a Rhodes Buyer. WARNING: If all 10 Niches are you, You are a Rhodes (company) buyer. And then buys a Rhodes - but not from General Boats: (they should have had a V-8, or at least, for their own future self interest, and the lasting interests of the community who offered so much of their time, a C of S) 54 years of superior customer support and over 35 years uninterrupted Rhodes production make it easy for owners to source critical parts to keep their Rhodes sailable and sellable, as well as for future owners to buy in comfort - because of the support of all those sellers and buyers to the Rhodes Certificate of Support program.